2. 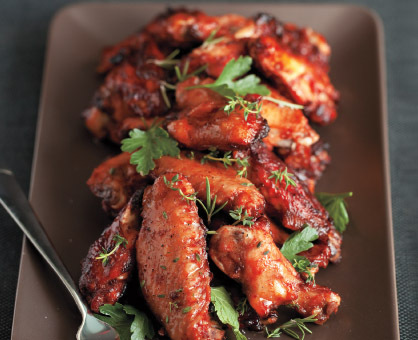 Prepare Grilled Buffalo Chicken Wings: Prepare outdoor grill for direct grilling over medium heat. Remove wing tips from chicken wings, then cut each wing in half at joint. Thoroughly spray wings with cooking spray; sprinkle with salt and pepper. Place wings on hot grill rack; cook 25 to 30 minutes or until wings lose their pink color throughout and internal temperature reaches 165°, turning every 5 minutes. If wings begin to burn, transfer to cooler part of grill. Transfer wings to large bowl.